I have a confession to make and I trust that this will stay between us. The first time I was invited to meet up with friends in Spitalfields, I looked the area up on Google Maps and thought it looked a bit too scary for me to be travelling to alone on a cold, dark January evening. It seems incredible to me now, of course, because in the space of nine short months, Spitalfields has become one of my favourite parts of London. And I had absolutely nothing to worry about in terms of safety and security. Spitalfields is located near Brick Lane and Liverpool Street in London's East End. It is an area that is steeped in history and is home to the Old Spitalfields Market that was founded in the 17th century. 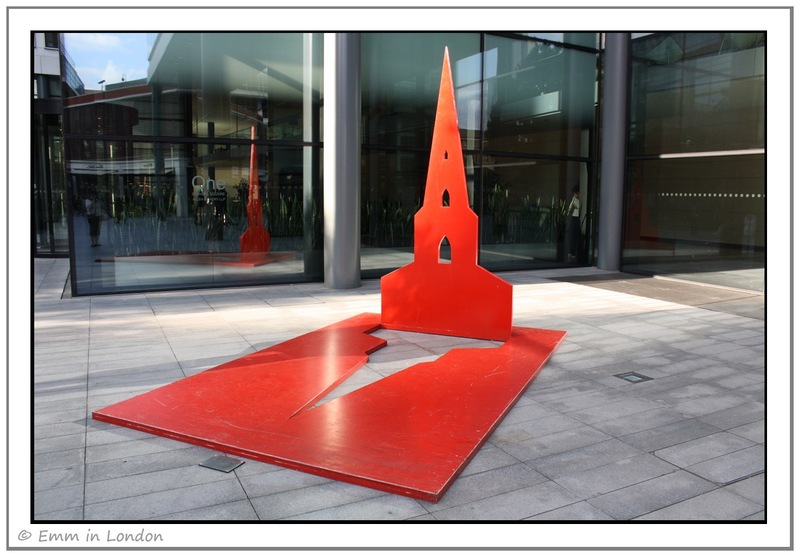 Today, Spitalfields is an increasingly trendy, up and coming area and I just love the installation art in the area. Kenny Hunter's I Goat is the newest piece of art in the area and was installed in January 2011. The public voted for Kenny’s design in a sculpture design competition which began in early 2010. Kenny states that I Goat represents “how each successive group of immigrants have faced their own combination of conflict, oppression and poverty”. I am quite fond of this little goat! 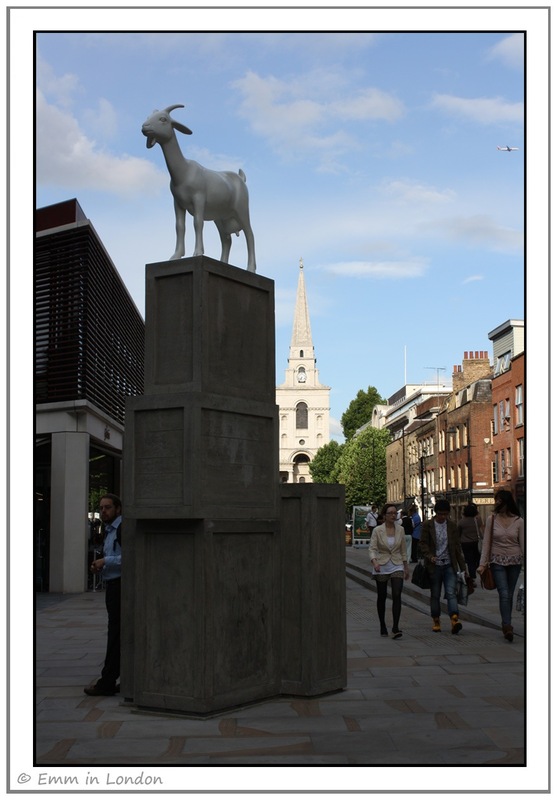 Eleonora Aguiari's Red Church is a likeness of Hawksmoor’s Christ Church in Spitalfields, which you can see in the background behind the I Goat above. Eleonora used red to represent a dialogue between purity and passion although she does tend to use red in many of her sculptures! 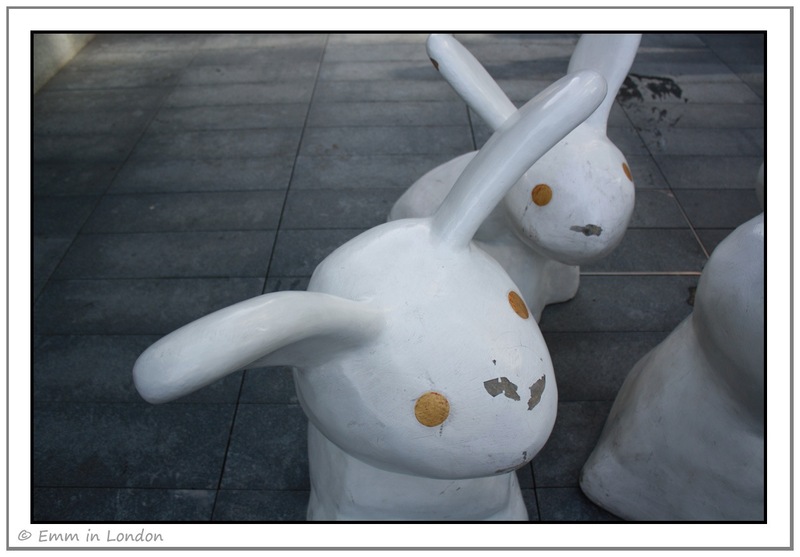 I know that we are meant to refer to the sculpture above as Spitalfields Spirit but really, everybody knows that they are the Spitalfields bunnies! I think these little things are adorable and they are meant to represent the spirit of community and diversity of the area. I quite liked Ali Grant’s A Pear and a Fig but soon discovered that it is not easy to photograph bronze in the correct light! 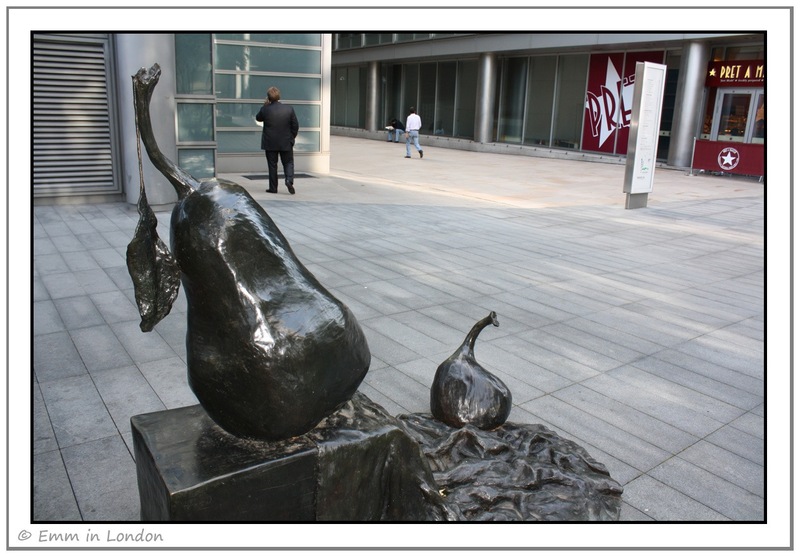 The sculpture is a reminder of the days when Spitalfields was a bustling food market. 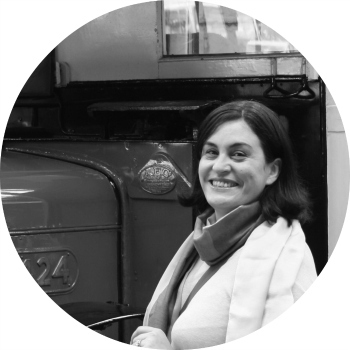 One thing is for sure, London is constantly changing and that is especially true for areas like Spitalfields. 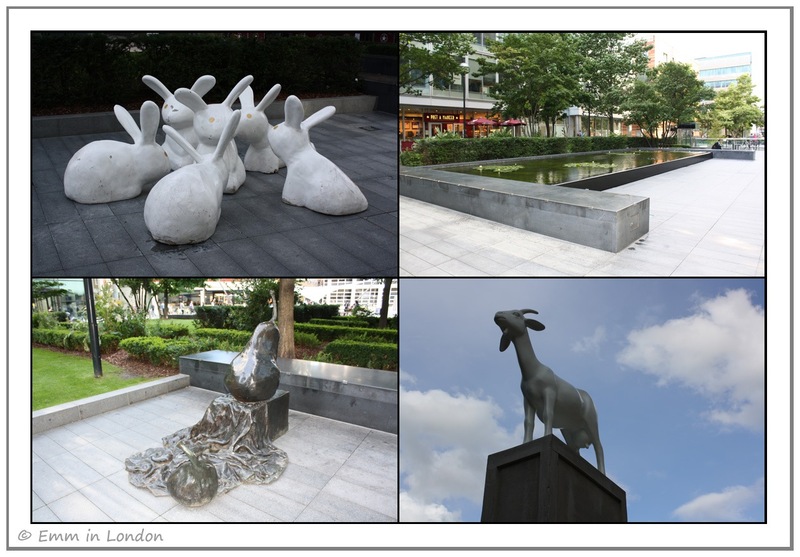 I see on the Spitalfields "About Art" page that more sculptures have gone up since my visit. That’s okay, I was looking for an excuse to return to the area anyway! What a lovely find, this part of your city is! I love the Pear and Fig, and yes, I imagine how hard that was to photograph!
. "..how each successive group of immigrants have faced their own combination of conflict, oppression and poverty”. How easy it is to forget that, once we have our own safely and security. I've never had a chance to be spitalfields all during my sojourn in London... pity! Heard quite a lot about it though! such an amazing place with theses sculptures! I'm usually not a fan of art or anything museum-y but this looks cool, and as I'll be living in Brick Lane this merits a visit! 've NEVER seen those bunnies. I LIKE those bunnies! What a gem of a post! I wouldn't have thought there was so much story behind each piece. Very cool. Looks like a quaint place to visit! I have passed through Spitalfields a few times heading to Brick Lane...and maybe it's too trendy for me! The sculptures look good though. Looks like a nice place to visit. I like that goat:-) And it is a nice art that pear and fig. That "Nittedal fyrstikker".. Nittedal is a place and it is Norway`s first matches. The bush in my photo is similar to the mark they have on their boxes. I'm glad you returned so we could see these works of art. Sometimes new places surprise us when we least expect it. Lovely post. So glad Spitalfields has become one of your fave places. @ John: Thank you! I found it quite difficult to do a decent, creative shot of that! @ Marion: Definitely. This is an area of great diversity but like so much about London, it tends to lose its history and get carried away in the grind of everyday life I think these pieces of art are important in challenging that trend. @ Ashwathy: I would certainly recommend it next time you are here. Or, I guess, I'd recommend seeing things you haven't seen before, especially if they have historical significance. @ Ola: Definitely. It is a great area! @ Oneika: oh, we'll have to change that! Museums and art can be quite cool if you get a proper introduction! @ Within Ireland: Yeah, you must check them out. @ Melizza: Those were the photos we took together! @ Rob: it certainly is. @ William: Ah, well, you know I do like to mix modernity and grand old structures! @ Spiderdama: I like the goat too! Thanks for answering about the translation! @ Anne: No, don't worry. They are permanently on display! @ Bibi & Dominic: me too. @ AVCr8teur: Always glad to be of service! @ Spitalfield E1: It has indeed! !